Japanese Imari charger finely enameled with panels of two phoenixes on stylized floral scrolling grounds - all in green, red, blue and purple enamel with gilding. The reverse side is decorated in underglaze blue with karakusa scroll pattern and with fork shaped factory mark. 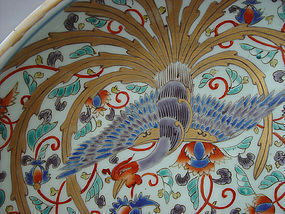 The phoenix (Ho-o in Japanese) is a mythological bird known to appear in time of peace and prosperity. It symbolizes immortality, resurrection and life after death. Dimensions: 16" (40.5cm) in diameter, 2 3/4" (7.2cm) deep.